'Martha's Vineyard 'Island People' Album #1: Six Men Standing in Road Near Shore. 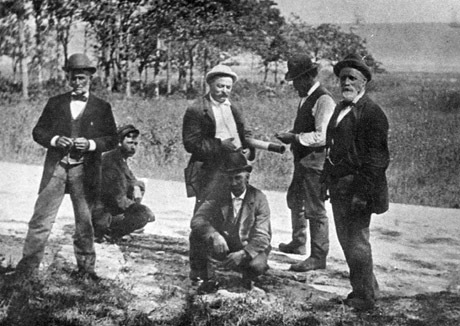 Six Men Standing in Road Near Shore. Handwritten Notes: "L to Right / Edmund Beetle / Charles B. Horton / Henry Daggett / Murry W. Horton / James P. Claghorn / Capt. Wm. Buckley"
Where are they? What is Henry Daggett carrying? It looks like a telescope. Can you identify any people, things, places, or events in this photograph? How about the time period? Or do you know where this photo came from? Email me at cbaer@vineyard.net. People: Beetle, Edmund; Horton, Charles B.; Daggett, Henry; Horton, Murry W.; Claghorn, James P.; Buckley, William, Capt.